I often search for application which will track my expense automatically. Well today my search is completed I have come across Walnut an Innovative Expense Manager. Let me share with you detail of Walnut with you. 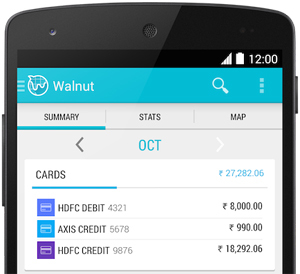 Walnut is free expense manager app that helps you to track your expense automatically. This app works in background it does not even require to open the app or to make data entry. It tracks your expense automatically. You must be wondering how it is possible to track expense without making data entry. Well that’s what the innovation is, Walnut analyze the SMS from your inbox and based on keyword tracking makes entry of credit and debit. It is perhaps easiest expense tracker I have ever come across. Walnut is always in auto-mode and deeply understands your SMS Inbox. Walnut does not require access or connection to any bank accounts. Walnut only looks at incoming message from business like bank, merchants etc. It does not analyse any personal messages. Walnut also gives insight of your financial transactions from single day to years at one place at one click. See all your SMS offers together in one place! Walnut works like magic you must download it. This app is supporting only android based smartphone. To know more about this app you can go through FAQ section. Credit Card Limit Enhancement – Should You Opt? « How to decode Income Tax Intimation 143(1)?